For many brothers and sisters within the electrical industry, the day of March 20th will pass quietly. Protected with training, personal protective equipment, and well-established safety rules their job duties will be accomplished safely. After they finish their duties, they will go home to their loved ones and silently affirm the legacy of one of the most valiant people to ever strap a pair of hooks on. Many will never know his name nor know what it took for him to see his vision come true. Sadly, many see the safety processes they have today as a given and at times an unfortunate hassle. Such was not the case for the people who toiled in the industry a century ago. Many sources state that the mortality rate for lineman at the turn of the century was fifty percent. Although concise statistics do not exist on the matter it is very likely that many the lineman who survived were injured or maimed. Such was their world until a man had the courage to create a new paradigm for electrical worker safety. IBEW records indicate that Lew Brooks was the president of Local 77 between the years of 1913 and 1914. At this time in history, union participation was a risky affair and meetings were often held in the forests surrounding Seattle to avoid physical violence. Lew and his fellow brothers drafted a “rigid” set of working rules during #77 meetings and took them to the state capital of Olympia. Lew lobbied hard and on March 20th Governor Ernest Lister signed them into law. Governor Lister was friendly to labor, the industry was not. Despite the fact that he had risen to the level of a foreman, Lew Brooks was fired from Seattle City Light for his participation in the creation of these laws. When he tried to find employment with other companies within the Pacific Northwest, he discovered that he had been blackballed. Today, we work in an industry that takes a very different approach to safety. After the 1913 laws were passed, other states followed suit and eventually a national set of rules for electrical workers would be adopted. In time, working rules would become a major driving force behind the development and maintenance of personal protective equipment, training, tailboards, and clearance procedures. 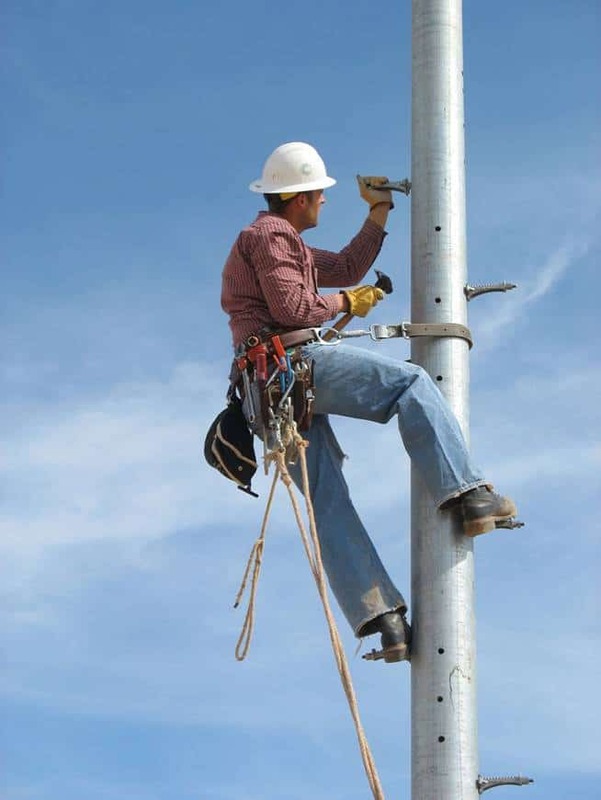 Rules changed what it meant to be an electrical lineman. In time the occupation of a lineman would become a highly respected position and the ability of lineman to safely perform their duties would be an object of admiration for those capable of understanding the challenges of doing so. When he couldn’t find work in the Northwest as a lineman, he went back to Michigan began to work as a temporary lineman again in 1923 for Consumers Power Co. In 1923, he started working for The Board of Water and Light Co. in Lansing Michigan. He was promoted to foreman, sometimes called upon to serve as superintendent, and recognized for his knowledge by being called upon to consult with engineers. Willing to count safety as more sacred than money, another stand for safety led Lew’s termination. He moved on to WPA and began working installing Lansing’s traffic lights. He had the courage to fight for safety to a point of personal cost. He had the courage to innovate one more time. For almost twenty years, Lew Brooks had been working on the idea of creating a set of adjustable lineman climbers. Until that point, all lineman climbers were the same size and much less comfortable than the ones we know today. Lineman of different shapes and sizes had only one choice of climbers. The inspiration for his adjustable climbers came from observing how crutches could be adjusted to fit people of various heights. 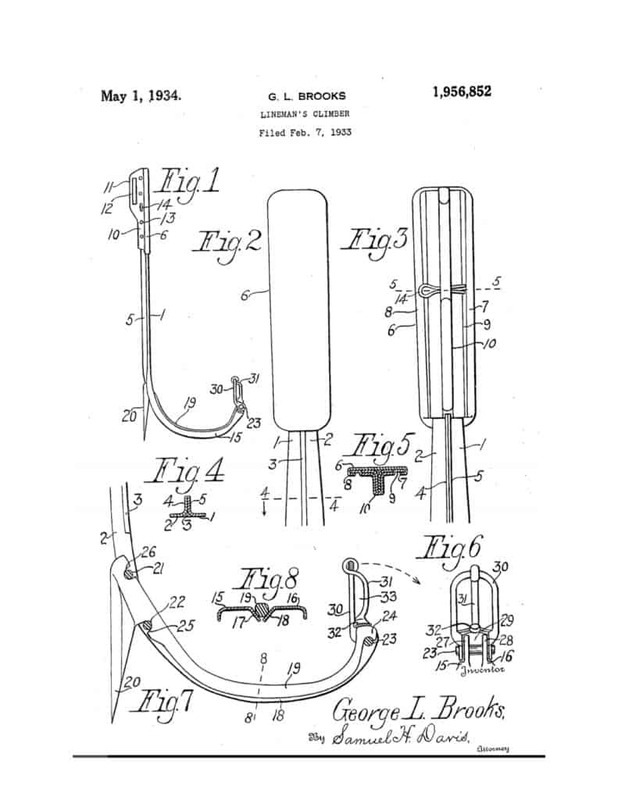 On May 1, 1934, a patent was granted for “Brooks Hooks”. Sadly, this ended up fifty days after Lew died. He did not live to see all his dreams come to fruition, but, since his time and thanks to his effort’s lineman have been climbing higher ever since. He saw a need to adjust the reality faced by people willing to make the climb. He had the knowledge to be properly cut-in to the specific safety needs of his industry. I wonder when Lew came home and told his family that his stand for safety had led to his termination how did they respond? Did they cry when they hugged their friends and left the Northwest? Did Lew recognize that in creating his safety rules he would make countless lineman safer and more efficient over a century? In a era when lineman proudly display their occupation and bravery in a public way, how many would have the courage to take a stand for safety like George Brooks. This March 20th, please remember the contribution of George Brooks and others by knowing that the safety rules that protect us are sacred and were bought at a high cost. The highest honor we can have within our industry is keeping ourselves and others safe on the job.